Toll Brothers will offer homebuyers an opportunity to personalize their dream homes with special kitchen and bath packages during its Dream Kitchen &Bath Sales Event, which takes place from March 5 to 20. 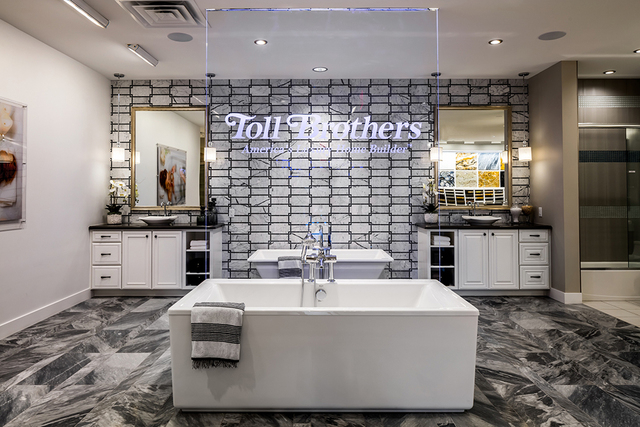 In addition to kitchen and bath upgrade savings, buyers can utilize Toll Brothers’ new Las Vegas Design Studio to see, touch and select all of the personalized elements of their new home. PROMOTIONAL Toll Brothers’ opened its Las Vegas Design Studio at 6140 Brent Thurman Way, Suite No. 160 in December. During the sales event, homebuyers can choose from a selection of home styles and homesites in communities across the Las Vegas Valley. After they purchase their home, our team of sales managers and professional design consultants will guide them through each step to ensure that creating a personalized Toll home is an enjoyable and life-enhancing part of the home design process. Toll Brothers has longtime partnerships with finest-quality companies, such as Kohler and Whirlpool. For more information, visit TollLifestyleTV.com, the company’s online video channel. To take advantage of the sales event, buyers must make a deposit between March 5 and 20. Homebuyers should contact their community of interest and speak with a sales representative to learn more. For those homebuyers who would like to learn more about financing, representatives from TBI Mortgage Co., a subsidiary of Toll Brothers, will be on hand in many communities to offer free mortgage guidance. Toll Brothers is currently building nationwide and is a publicly owned company. In Fortune magazine’s 2016 Survey of The World’s Most Admired Companies, Toll Brothers was ranked No. 6 worldwide across all industries in Quality of Products/Services Offered after Apple, Walt Disney, Amazon, Alphabet and Nordstrom, and before Netflix, Facebook, Alcoa and Wynn Resorts. Toll Brothers was honored the prior year as one of the World’s Most Admired Companies 2015 by Fortune magazine, ranking No. 1 in numerous homebuilding categories. The company was named America’s Most Trusted Home Builder 2015 by Lifestory Research, receiving the highest numerical score among the largest 133 homebuilders in the country. Toll Brothers was also recently honored as national Builder of the Year by Builder magazine, and was twice named national Builder of the Year by Professional Builder magazine.